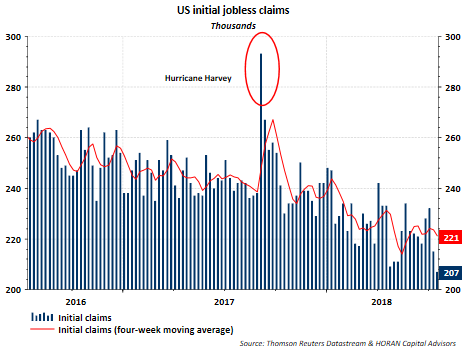 Initial jobless claims are at their lowest level in nearly half a century, being reported at 207,000. The Conference Board's Leading Economic Index (LEI) report increased .5% in June. On a year over year (YOY) basis the LEI is up 5.8%. Also displayed on the below chart is the data for the industrial production report released earlier in the week. Although May's report was revised down to -.5% versus the prior reading of -.1%, June's report was reported up a strong .6%. On a year over year basis industrial production is up 3.8%. 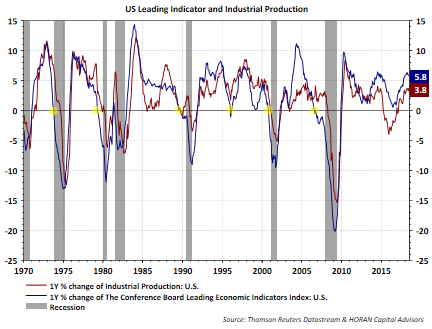 When both the LEI and industrial production YOY numbers turn negative this is when one might want to be on the lookout for an economic slowdown. The reports this week are far from negative. Econoday noted in their report on the LEI, "Building permits are the only weakness with the new orders index of the ISM manufacturing report the leading strength in a report that points to steady economic growth ahead." 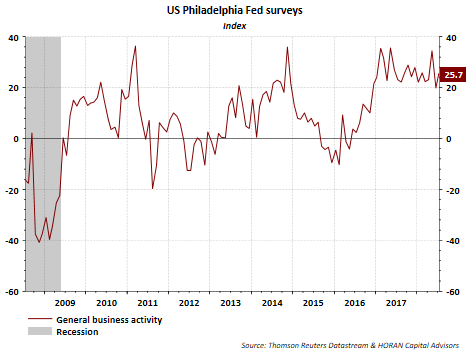 The Philadelphia Fed Business Outlook Survey this morning was reported at a strong 25.7 and exceeded consensus of 22.0. One negative from the report was the increase in the prices paid component that rose 11 points to 62.9, which is one of the highest on record. This increase in prices is most likely a result of issues surrounding tariffs and trade. Also notable in the report is the rise in orders, up 13.5 points to 31.4, with unfilled orders jumping to 11.0, a 14 point gain. 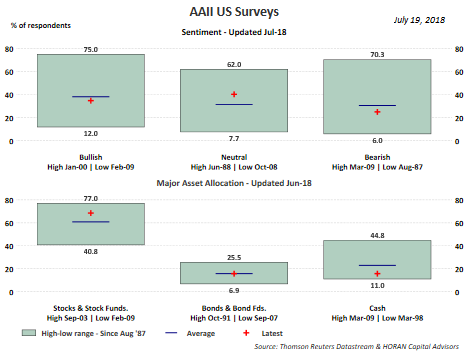 Today The American Association of Individual Investors reported individual investor bullish sentiment declined 8.4 percentage points to 34.7%. 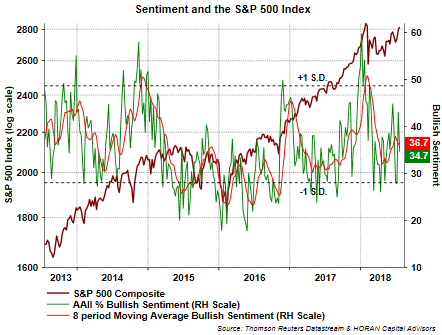 Bearish sentiment also declined by 4.2 percentage points to 24.9% with the net result an increase in neutral sentiment by 12.6 percentage points to 40.4% and above its longer term average as seen in the first chart below. The second chart shows the decline in bullish sentiment along with its 8 period moving average. The bullish average is less volatile and remains just below its long term average level. Again, these sentiment measures are contrarian ones and most useful at their extremes. The near average reading for bullishness is some indication of the indecision facing investors, maybe due to the disconnect between news headlines and actual business and economic results; and thus, the higher than average neutral reading. Overall, much of the economic and company news seems highly positive. One could surmise this good news might be all priced into equity prices, but the current overall economic and business strength does not seem to be suggestive of an economic downturn any time soon. Certainly the issues around tariffs and trade, and their 'potential' negative impact, are worth maintaining a close watch on.